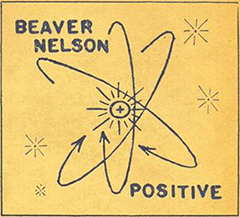 All of Beaver Nelson's music can now be purchased at theconnextion.com! The whole album finds Nelson as spry and clever as ever in both the wordplay and melody departments; there's really not a song on here that slips by without an indelible hook, line or chorus that doesn't stick on the first spin, and there’s a handful — most notably the hard-charging but wildly careening, batshit crazy "I Need a Line to the Underground" and the wise, sweetly optimistic "Are You Positive?" — that would be first-round picks for a future Beaver best-of. There's really no need for one of those, though, because like every record he's ever made, Positive holds its own from start to finish and only gets better and better on repeated listens. But in that spirit of positive thinking and boundless inventive energy he brandishes so well, here's hoping Nelson polishes off an even better one — or hell, maybe even a couple of 'em — before 2020.